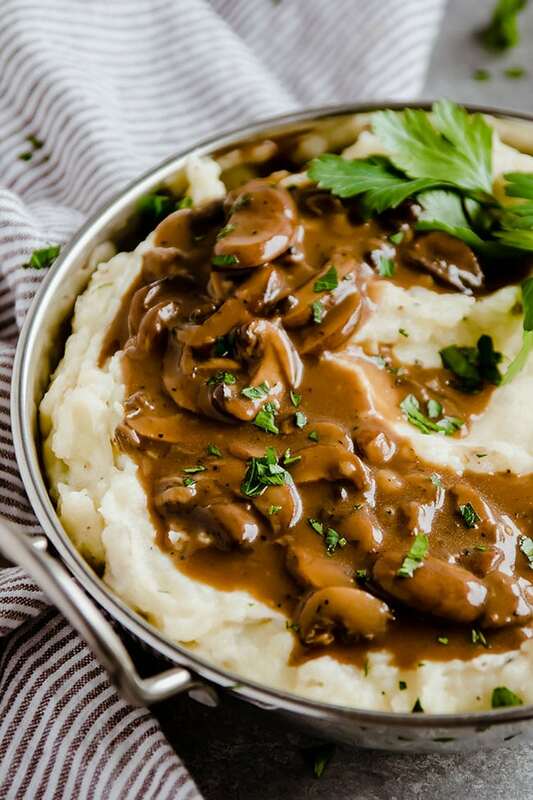 These easy white cheddar mashed potatoes are topped with a simple mushroom Guinness gravy. Vegetarian. Alright. 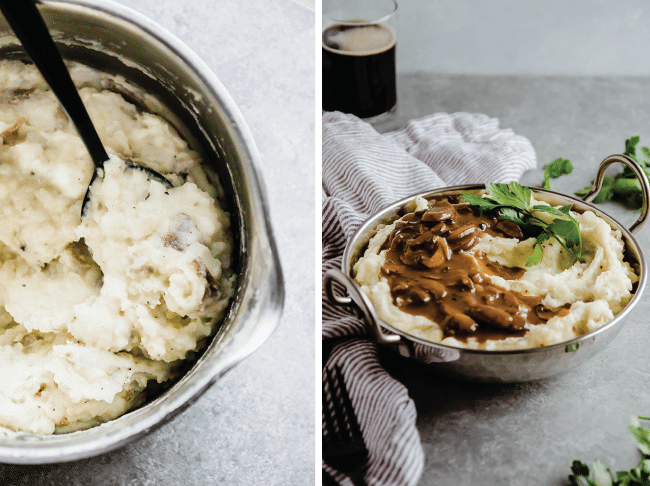 We need to talk about these mashed potatoes. But we ESPECIALLY need to talk about this vegetarian (!!!) stout gravy. I’ve tried my fair share of vegetarian and vegan gravies, and this is by far my favorite. I always missed the depth of flavor that you get from meat drippings, but the earthiness of the mushrooms here with extra depth from some stout and a splash of soy sauce really does a great job of mimicking traditional gravy. If you’re not vegetarian, you can use beef stock here and omit the soy sauce, but I’m a fan of it just the way it is. Also, let’s talk about these mashed potatoes! Because mashed potatoes = life. Ready in 45 minutes or less! Boil the potatoes, make the gravy while you wait for the potatoes to cook, and mash it all up. Boom, ready, donezo. You only need a handful of ingredients, and I bet you’ve got most of them on hand already. Because you’re amazing. THERE IS CHEESE. You’re welcome. These mashed potatoes are good with all kiiiiiiinds of things! Yes, this gravy is my new BFF, but I also love these potatoes with a nice pot of braised short ribs, roasted chicken and veggies, or, y’know, on their own topped with some extra cheese. Just think of these white cheddar mashed potatoes as your culinary blank canvas. POSSIBILITIES! I like it. 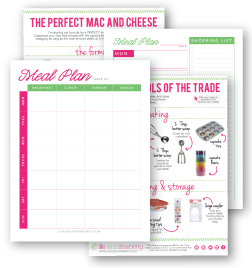 PS – In a weeknight dinner rut? Find more recipe ideas on the Potatoes USA Facebook page or in the LAAS Recipe Index! We’ve got you allllll kinds of covered. 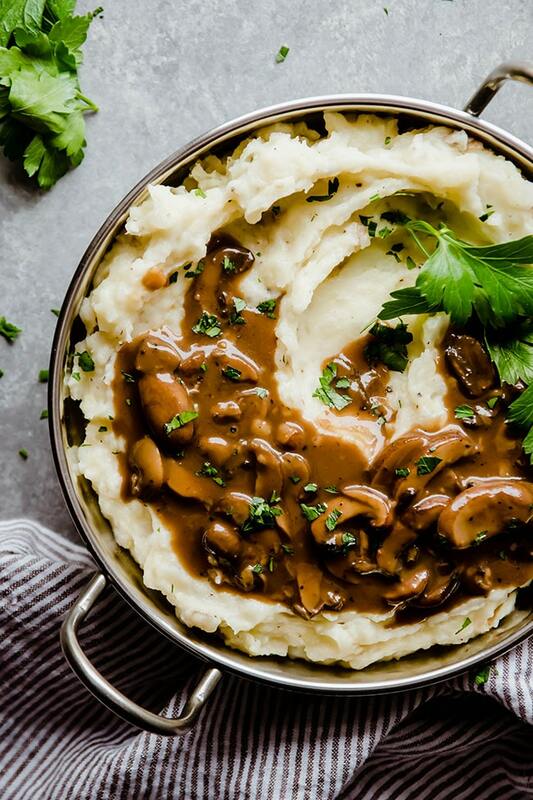 This simple vegetarian mashed potatoes and mushroom gravy recipe gets a flavorful boost from a splash of Guinness. Cook potatoes in salted, boiling water until easily pierced with a fork. (Prepare the gravy while the potatoes cook if you like). Drain cooked potatoes and set aside, then return empty pot to the stove over low heat. Add butter and milk to pot and warm until butter is melted. Return potatoes to pot and mash. Add shredded cheese, salt, and pepper to mashed potatoes. Stir until cheese has melted, then taste and add seasoning as necessary. Add mushrooms to skillet and cook, stirring occasionally, until mushrooms have reduced in size by about half. Add soy sauce, salt, and pepper and stir to combine. Add flour and stir to combine. Let cook 30 seconds or so until liquid has been absorbed. Add stout a little at a time, stirring constantly to break up any lumps of flour. Add stock and stir to combine. Bring to a low simmer and let cook, stirring occasionally, until gravy has thickened to desired consistency. You can let the gravy simmer on low heat until the potatoes are ready! 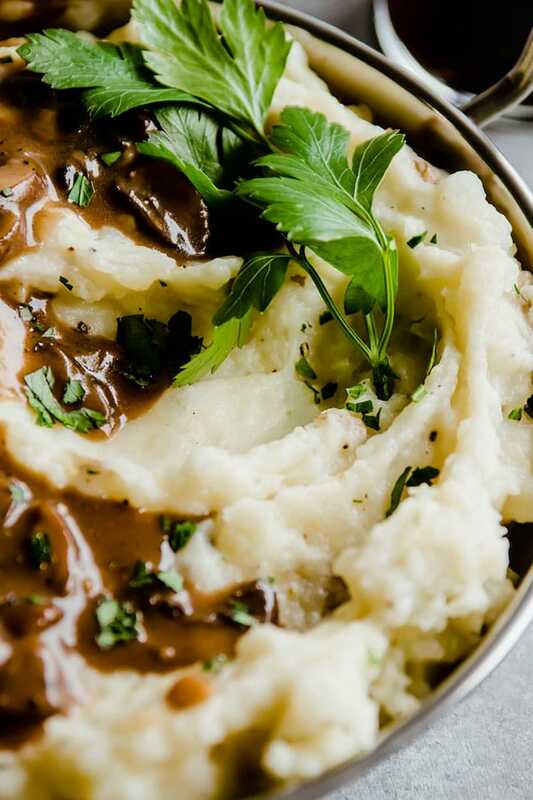 Top the mashed potatoes with gravy and chopped parsley (optional) and serve immediately. Good quality vegetable stock is a must here – use homemade if you have it, or look for an especially tasty low-sodium variety at the store! Use beef stock or chicken/turkey stock in place of the vegetable stock if you like. You can omit the soy sauce if you use beef stock. 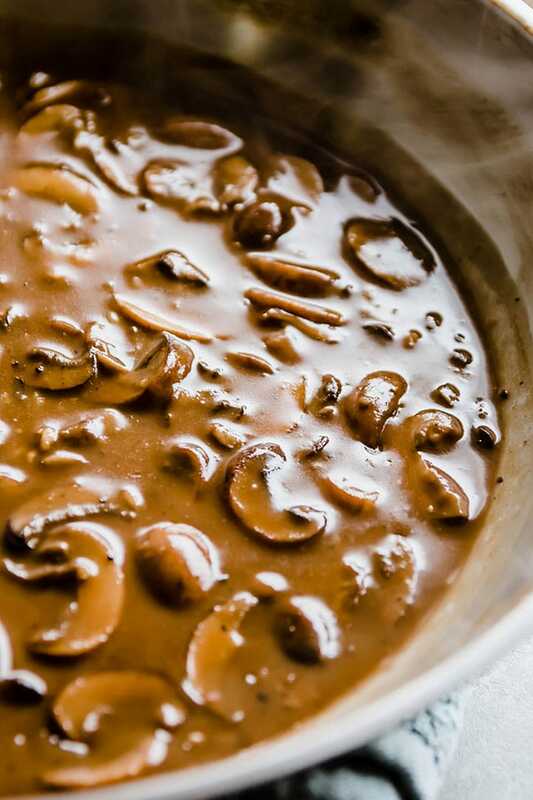 If the mushrooms look too dry before you add the flour, you can add an extra pat of butter to the pan. A note about Guinness: All kegs worldwide are now vegan (the production process used to involve isinglass, a fish product used to filter beer) and reports indicate that the aim was for ALL Guinness (including bottles and cans) to be vegan-friendly by the end of 2017. I’ve seen a few unconfirmed reports that bottles and cans are indeed now vegan-friendly and reached out to the company to see if they can confirm this for us – I’ll report back! If you’re vegan/vegetarian and are worried about it in the meantime, get a growler filled with Guinness on tap somewhere (all vegan!) or look for a stout that isn’t filtered with isinglass.